As you progress through this challenge I have noted there are many of you who have no idea how to train with weights. With that in mind I felt it was important to teach you a few things about weight training. Obviously you could easily go to Google and look up advice for weight training, but there is a tremendous amount of misinformation available on the web about weight training (and every other fitness topic). Today I will talk to you about body part splits and full body training and discuss which one I think is most appropriate for which circumstances. Most of you have the same goal. You want to lose fat and tone up. Well, I am not a fan of the term “tone up”, but will define it the way I see it. Toning up means you want to look leaner and more cut. I will use that definition going forward. Since your goal is to lose fat and tone up you are going to want to gain muscle and at the same time, have a cardio effect during weight training. Keep that in mind as we continue this discussion. 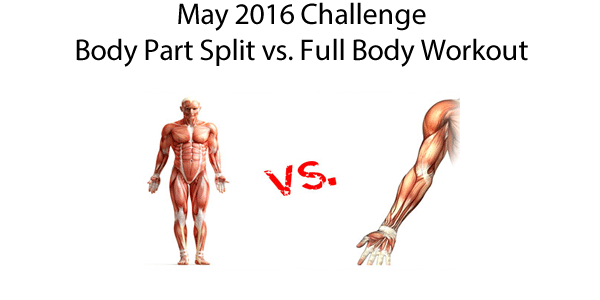 What is a Body Part Split? This approach lowers the frequency with which you train each muscle group. This approach has its own benefits though. The ability to handle greater loads. There is less body fatigue when doing a body part split, which translates into bigger weights being moved. Greater attention on each muscle group. By training each group separately you can focus on different angles and changing up the repetition scheme used. Many times this results in higher quality training. Less chance of over training. Your central nervous system takes a good hit from weight training. A body part split eases the load on your central nervous system. A full body workout involves alternating workouts that hit every body part each time you workout. This generally means that you train every other day. In many situations you would simply train with weights 3 days a week (usually Monday, Wednesday and Friday) and do cardio on the other days. When I prescribe full body workouts I generally give a Workout A and a Workout B and have the client alternate between the two workouts. Greater frequency per muscle group. You will hit every muscle group every workout. This means you will train your arms 3 times a week at a minimum, your back 3 times a week at a minimum, etc. Higher energy expenditure per workout. Because you hit more muscles you will also expend more energy. This means you can eat a higher calorie diet, skip the cardio session after your weight training and gain more mass with less fat gain. Greater depletion and super compensation. A full body workout basically leaves your body saying “WTF?” A ton of microtrauma, protein degradation, and glycogen depletion has just occurred, leaving the body in an extremely primed state for nutrient uptake and anabolism to take place. Provided you give the body what it's asking for nutritionally, a superior supercompensatory effect will result. Greater anabolic hormonal stimulation. A full body workout will stimulate more growth hormone release in your body. While the effect is short lived, it is enough to make a difference in your fat burning efforts. This covers an entire year of training. This method works very well. Give it a try and let me know how you do. If you need help programming your workouts contact me via the contact form on this site and I will gladly help you out.